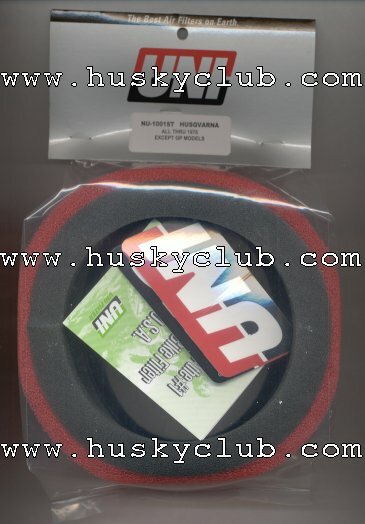 Uni Filter Inc. has been a foam air filter manufacturer since 1971. We have developed into the largest maker of aftermarket foam air filters in the world. Uni Filter Inc. entered the air filtration industry in 1971 with a simple concept, "Let's design an air filter that works!" The founders of our company chose to use polyurethane foam as the filtration media because of its superior dirt capturing abilities. Polyurethane foam had been used as a filtration media for many years, but not until Uni Filter introduced the patented seamless "Sock" Filter for motorcycles and small engines in 1973 did it receive mass acceptance. This dependable High Air Flow Filter launched a product line that now covers virtually all popular motorcycles and ATV's. Foam filters were in their infancy in the early 1970's. In the 1980's and 90's their "High Air Flow" and superior filtration abilities made them the choice of every dirt bike and ATV manufacturer worldwide. Many high performance street motorcycles have also made the switch to foam air filters because of the superior performance advantages of foam air filters. Uni Filter's cutting edge technology, along with this proven superior filter media, is the perfect team to address any filtration concern for the 21st century. Every Twin Air filter is constructed from two layers of open-pore foam that are bonded together to provide maximum filtration and superior airflow. A coarse-foam outer shell is fused with a fine-foam inner core, resulting in a one-piece design that is both functional and durable. The one-piece design permits continuous filtration and airflow while protecting your engine from dirt, dust and even sand. A thick, soft-foam sealing ring provides maximum contact with your airbox, even in the worst riding conditions. The sealing ring acts as a breathable gasket allowing air passage while restricting dirt and dust. Whether you are riding through the woods, across the wide open desert, or at your favorite track, you can depend on Twin Air providing your engine with lots of clean air. If Twin Air can't keep your engine clean, no other filter can! Twin Air filters are designed slightly smaller than stock filters. The resulting increase in air volume around the filter improves circulation within the airbox. More air means more power for your engine. Flow bench tests have proven that Twin Air filters provide increased airflow while reducing the filters tendency to clog. You won't have to worry about your filter falling apart, because all Twin Air filters are constructed using an exclusively formulated adhesive that is unaffected by repeated cleanings, harsh solvents or gasoline. Twin Air filters are the choice of champions because they provide more power and longer life for every high performance engine. 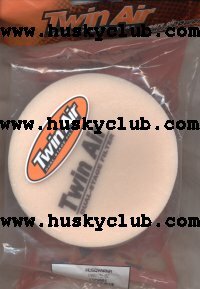 Both UNI and Twin Air produce the very best filters for your Husky. There maybe other brands on the market that are produced to make more profit for a business or shop. Your Husky is too valuable to consider anything but the best. Please let me know if there are other filter products I should carry. 1) How long does a foam air filter last? Or how long should I use my existing filter? A foam air filter filter, in my opinion, has a life expectancy of 2 years once it is in an oiled condition. You should not wait until the filter starts to disintegrate, once this is happening, you have waited way too long. Kinda like replacing your knobby tire after it has no centerline tread. If you use the bike quite often, it might be best to replace more often. 2) What should I clean my foam filter with ? Gasoline? Varsol? Kerosene? I just read an interesting article on foam filter cleaning and the article stated that Turpentine is the best liquid to clean foam filters oiled with standard oil products. The dirt will settle out in the turpentine and you can pour off the clear and reuse again and again. The turpentine will not break down the glue use for filter assembly. I personally have used gasoline and varsol for years with great sucess. Varsol will allow particle settling as well and you can reuse. I currently use No Toil oil and it is great, water cleanup. 3) Do I really need to use grease around the sealing surface of the filter? Yes, you really do. The grease acts a sealant/glue taking care of any imperfections between the foam, cage, and filter surface and it is important to achieving the best possible seal. Leaving it out will lead to unfiltered air leakage and engine damage. 4) Leaving a dirty filter on a bike seems to shorten the filters life, what causes this? I don't know for sure, but it must have to do with some microbes in the dirt that eat up the foam filter. 5) Can i use regular motor oil on my foam filter? Any oil is better than none. Air filter oil is specially formulated to have a much higher "sticky" property than motor oil and it is the oil, not the foam, that does the filtering. 6) Do you have the round Aluminum covers that fit 67-75? How about the trim pattern for the Mag 250? 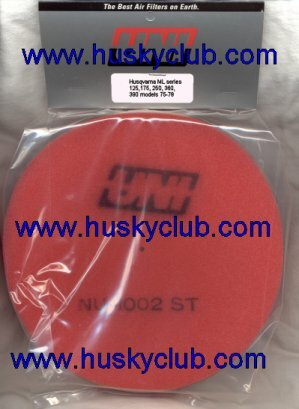 Yes, we stock new, correct aluminum covers, manufactured to Husqvarna 4 Speed specifications and will supply trim specs for Mag 250 if needed (250 mag oem filter cover has cutouts to allow proper fit). These covers are unpainted, can be polished, originally were painted same silver as frame. 7) My air cleaner aluminum cover is all cracked and mashed around the mount points. Did you realize that the nylock nuts you use to take on and off to hold the air cleaner are only good for 2-3 uses? This means you should keep a stock of these nylock nuts on hand and replace on a timely basis. If you do not, you have to overtighten these nuts and washers to hold them ever securely and this mashes and cracks the outer aluminum cover. do not use locktite on these as it will deter you from servicing the air filter. Also the studs wear and this adds to the whole problem, now these are available!